This post is about the House of Lords register of members interests, an online resource which describes the financial and other interests of members of the UK House of Lords. This follows on from earlier posts on the attendance rates of Lords, it turns out 20% of them only turn up twice a year. I also wrote a post on the political breakdown of the House and the number of appointments to it in each year over the period since the mid-1970s. This is all of current interest since reform is in the air for the House of Lords, on which subject I made a short post. Category 2 Remunerated employment, office, profession etc. The values of these interests are not listed but typically the threshold value for inclusion is £500 except where stated. The data are provided as webpages, with one page per initial letter there are no Lords whose Lord Name starts with X or Z. This is a bit awkward for carrying out analysis so I wrote a program in Python which reads the webpages using the BeautifulSoup HTML/XML parser and converts them into a single Comma Separated Value (CSV) file where each row corresponded to a single category entry for a single Lord – this is the most useful format for subsequent analysis. The data contains entries for 828 Lords, which translates into 2821 entries in the big table. 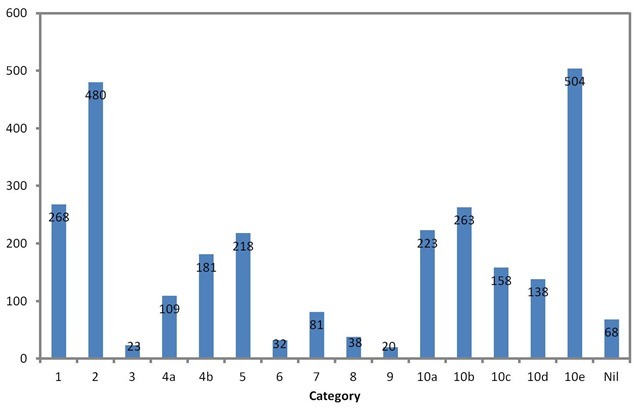 The chart below shows the number of entries for each category. This breaks things down into more manageable chunks. I quite like the miscellaneous category 9, where people declare their spouses if they are also members of the House and Lord Edmiston who declares “Occasional income from the hiring of Member’s plane”. Those that declare no interests are split between “on leave of absence”, “no registrable interests”, “there are no interests for this peer” and “information not yet received”. The sponsorship category (6) is fairly dull, typically secretarial support from other roles. Their Lordships are in great demand as officers and trustees of non-profits and charities, as indicated by category 10e, and as members on the boards of public bodies (category 10b). I had hoped that category 2 would give me some feel for occupations of Lords, I was hoping to learn something of the skills distribution since it’s often claimed that the way in which they are appointed means they bring a wide range of expertise to bear. 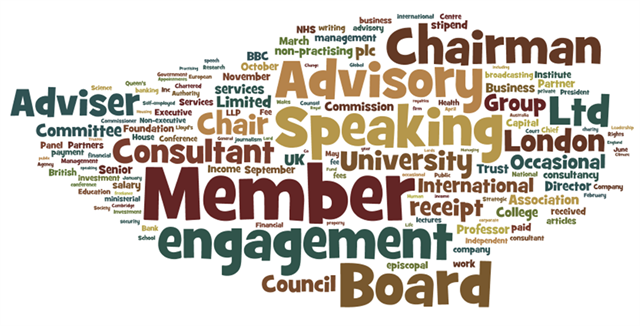 Below I show a wordle of the category 2 text. There’s a lot of speaking and board membership going on unfortunately it’s not easy to pull occupations out of the data. I can’t help but get the impression that the breakdown of the Lords is not that dissimilar to that of the Commons, indeed many Lords are former MPs – this means lots of lawyers. You can download the data in the form of a single file from Google Docs here. I’ve added an index column and the length of the text for each entry. Viewing as a single file in this compact format is easier than the original pages and you can do interesting things such as sort by different columns or search the entire file for keywords (professor, Tesco, BBC… etc). The Python program I wrote is here.